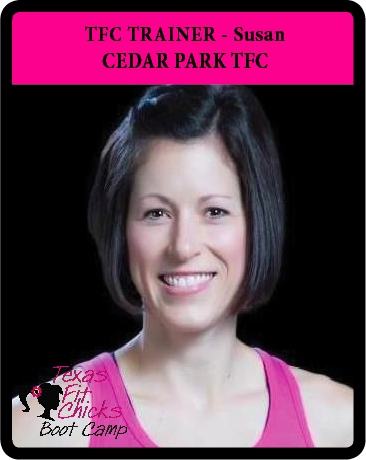 Welcome New Camp: Cedar Park Texas Fit Chicks! CAMP OFFICIALLY STARTS ON SEP 8th! Susan has always enjoyed being active. As a high schooler she happily bounced from volleyball to basketball to tennis to softball, earning a letter in all four sports and enjoying the camaraderie that being on a team provides. After graduating from college, getting a desk job, getting married, and having two children, some extra pounds inevitably crept on. Together with her husband five years ago, Susan embarked on a renewed workout routine that had them exercising together each morning at 5am. To her surprise, the 5am workouts agreed with her, and Susan noticed that the more committed she became to her fitness regimen and good nutrition, the happier and healthier she was as a person. This passion led Susan to pursue a personal training certification from the American Council on Exercise (ACE), and also to led her to become a Texas Fit Chicks trainer in 2013. Susan's main goal is to let women know that they have the ability, strength, and power to completely change their bodies! She believes women are a critical component to turning around the trend of obesity in our country because of their influence in families. Her motto is to train hard, eat clean, and have FUN in your workouts! Research says that a good trainer or camp can build and increase self-confidence and self-respect in the young players. Basketball is the most popular sport among youth and adult players. I came to know that many well know camp organizers organize best basketball camps in Texas for youth boys and girls. TFC Supports ALS and The Ice Bucket Challenge! 30 Day Fat-Blast Meal Plan!! TFC Trainers Share Their Favorite AB Exercises!